Learn new and mat-tested methods of enhancing children’s classes in the dojo! Learn new and mat-tested methods of enhancing children’s classes in the dojo! The workshop faculty is an experienced group of eleven Sensei, Aikidoists, and Educators from around the world who gathered to provide “how-to” resources and share best practices. 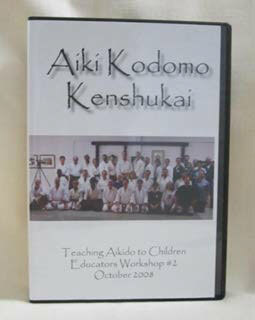 Whether you are new to teaching Aikido to children or a seasoned Sensei, you will gain new insights from these DVDs and will be able to energize and improve your children’s Aikido classes. Michael Friedl Sensei, 6th dan, was a Karate instructor when he first encountered Aikido in 1972. He was surprised by the power behind the art and redirected his studies. In 1994 Michael Sensei moved to Oregon and started Aikido in Ashland (CAA). Aikido in Ashland offers classes for all ages and has an enrollment of about 60 in its children, youth and teen classes. Michael Sensei is sensitive to the different interpretations of The Art of Peace in his fellow teachers and students. Michael Sensei teaches part 1 of a class with children ages 5 – 12. Bill Gray Sensei, 4th dan, has been teaching Aikido to kids for more than 10 years. His Redmond, WA dojo (CAA) features a separate program for children where enrollment typically numbers over 100 students. The Children’s Academy is based on the belief that a fun, stress free, positive, non-competitive environment encourages learning and confidence. In this seminar, Bill Sensei shares his insights on teaching 4-12 year olds. He shows how kid’s natural tendencies for questioning and imagination can be used in the study of Aikido. He shares games that foster focus and respect both in and out of Aikido class. Bill Sensei teaches part 2 of a class with children ages 5 – 12. Instructor participants share thoughts, questions, and personal experiences relevant to the classes on disc 1. José Bueno Sensei, 4th dan, has practiced Aikido for 24 years. In 1994 he left his job as a successful architect to become a full-time Aikido instructor in his own dojo and has several projects off-mat. In 2003, he founded Acão Harmonia Brasil (Harmony in Action Brazil) which teaches Aikido to disadvantaged children in the favelas of São Paulo, offering them an alternative to the endemic violent conflicts of their world. Some of these children have become regular students in his dojo and assist Bueno Sensei at leadership training seminars, where he teaches the principles of Aikido to top executives throughout South America. Even free-style training needs ground rules. In this seminar, Lisa Smith-Rice Sensei, 1st dan, from Triangle Aikido in North Carolina (Independent) shares some secrets to structure jiyuwaza that work well with her 5 year olds and up class. She presents the three rules of surviving randori, the ten principals of successful randori, three most successful aikido techniques applied to randori, and drill and games modified for randori all with the goal of creating the most effective learning experience. Wow, all that in less than one hour! Children frequently ask, “When is the right time to apply Aikido techniques outside of the dojo?” Aviv Sensei demonstrates practices that teachers can use to educate students about avoiding physical confrontations. Aviv Sensei has been teaching Aikido since 1989 and became Dojo Cho of the non-profit Aikido in Fredericksburg in 2001, where he teaches students of all ages. Since the first Aiki Kodomo Kenshukai in 2006, the children’s program at Aikido in Fredericksburg (TAA) has been frequently sold out! Melissa Fischer Sensei, 2nd dan, and Pete Wilkins Sensei, 1st dan, both teach a variety of classes at Tenzan Aikido (Independent) in Seattle, WA, including pre-school, ages 6 & up, and Parent/Child Aikido. Before focusing on Aikido, they studied a variety of martial arts and dance. In their program, yoga and Brazilian jiu-jitsu are integrated into Aikido training in a way that helps children reach their unique potential. The goal is to recognize the interconnected physical, emotional, and social dimensions unique to each child and use Aikido to help develop individual potential. Ross Robertson Sensei, 5th dan, founded Still Point Aikido (Independent) in 1991 with the philosophy that students are participants in a mutual learning process. In this session, Ross Sensei applies this belief to the teaching of 6-12 year olds. He offers support to teachers who want to let children self-direct more of the class process. He shares his experiences of the rewards of taking this approach to teaching. In this class, Bill Sensei’s imaging and questioning is applied to kids 10 and up. Many of Bill Sensei’s teen students have developed the focus and technique to graduate to the dan ranks. Bill Sensei also discusses the value of an instructor’s program for children’s class. Bill Sensei teaches the first half of a class with kids ages 12 and up. Robert Kent Sensei, 3rd dan, began his Aikido training in Kyoto in 1984. He joined Aikido West (CAA) in 1991 and inherited leadership of the children’s program in 2001. The teen’s classes in his program are technique centered; incorporating Aikido skills, physical skills, discipline, and games. Senior students are invited to learn by helping the younger class and parents are encouraged to train with their kids. Rob Sensei teaches part 1 of a class with kids ages 12 and up. Robert Kent is the founder of Aikidokids.com, an online community for Aikido teachers and the kids they teach. He has been working with young teenagers for over 25 years. He reviews the classes on disc 5 with the instructor participants. This session focuses on several developmental stages and theories using dojo examples to better understand our growing audience, their capabilities, their challenges, and the opportunities we have as teachers and role models. Donna Pienkowski, 2nd dan, is a licensed middle school teacher, has thirteen years of experience in the classroom including several years as a Special Education teacher and several years teaching adults. She assists with the children and youth programs at Aikido in Fredericksburg. Seminar host Aviv Goldsmith moderates discussion with participants about seminar topics ranging from ranking and promotions to behavior. Alex Vanderburgh Sensei, 3rd dan, is an instructor who has worked with kids for nine years. He currently teaches the children’s summer program at Aikido West. His game-centric approach to Aikido is flexible enough to apply to kids in grades K-8. The goal of Martial Play is to help develop students’ emotional intelligence, but the lessons are in self-respect and non-violent conflict resolution. Martial Play breaks with the tradition of linear and hierarchical martial arts training and focuses on creating a safe environment for practice for behaviorally-challenged youths. Included is a PDF of the resource material binder provided to all seminar participants. It includes handouts from presenters and additional resource material. Kudos to you and Donna for putting on such a wonderful seminar and thank you for the invitation to teach and participate in the event. Your guest teachers were extremely talented and a wealth of information. You are providing something to the Aikido community that will be of great benefit. What a gift for children to learn the principles of Aikido, of resolving conflict in a non-violent way at such an early age. I appreciate the work you are doing. I really enjoyed the entire weekend, thank you so much for your vision and organization of the event! I made some new connections, learned a lot and had a great time at all the classes and events. I will be mulling over the material for months! I wanted to tell you what a fantastic experience the weekend was; it was probably the most information-packed seminar I’ve ever attended in my life (including aikido and professional occupational therapy seminars). It opened up an entirely new world to me; I’ve already started using some of what I reembered and stood out for me with my kid students, and they are loving it! You and Donna did an unbelievable job putting it together. You can already sign me up for next year. I’m still flying high from last weekend. I wanted to say thanks for all the hard work you put in getting the kids seminar organized, I learned a lot, the more I teach the more I realized I learned. I had my first aikido kids class today since last week. Our first session we had decent classes, today was the first class of a new session, if I say so myself it was AWSOME! I also got a lot of compliments from the parents, they loved it.